Dr. Tom Pousti is a highly skilled liposuction specialist who now has offices in La Jolla where he can see La Jolla liposuction patients. In the paragraphs below, Dr. Pousti describes the liposuction procedure. He has helped many patients achieve a more youthful and shapely appearance. 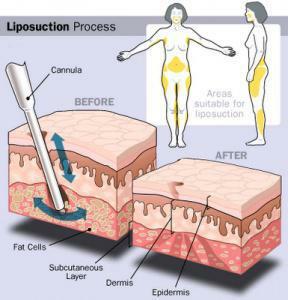 Liposuction surgery has now become the most commonly performed operation in Plastic Surgery. This procedure is used to improve your figure in either one specific area, or in several areas. Modern liposculpture is a both a scientific procedure and an artistic one, incorporating a concern for the patient’s well-being and health during and after surgery with a genuine artistic sculpting of tissues. Who Will Benefit From The Procedure? Patients seeking liposuction for improvement of body contour have generally tried multiple diets and exercise programs, to no avail. Certain problem areas remain. It is important to realize that suction lipectomy is not a method of weight reduction in itself, as relatively little weight of fat is removed from the body when the surgery is performed safely. The procedure is designed specifically to improve body contour. Therefore, it is important for you to be at or close to your “set point” weight. 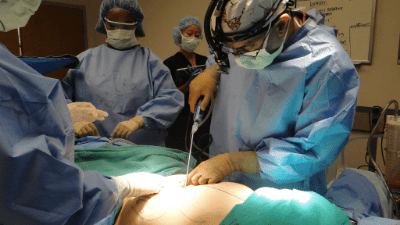 To be safe, the surgeon must not exceed the safe limits of fat removal or administration of local anesthetic, and always consider the health of the patient before proceeding with the procedure. Liposuction will not change the appearance of the skin. Skin which is loose, dimpled, wrinkled, or having multiple depressions or waves prior to surgery, will not be improved following surgery. In general, patients with firm elastic skin with minimal wrinkling and redundancy, with well-controlled and stable weight, and with limited areas of fatty tissue excess, can expect the most favorable results. Localized deposits of excess fat in the hips and “saddle bag” areas, as well as inner and outer thigh areas, are usually quite improved following the procedure. Given the same effort and diet as before the surgery, patients maintain a slightly lower weight, with much less trouble from the “trouble spots”. It is the obligation of the patient to continue to watch their diet and exercise as much as possible. The procedure varies between 1 and 3 hours, depending upon how much work is to be done in various areas of the body. 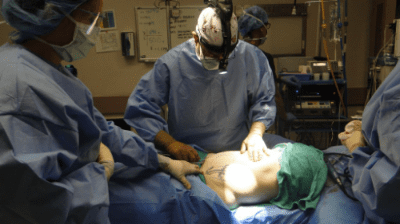 Liposuction is generally performed in an outpatient operating suite. Incisions for the procedure are generally one quarter inch in length and are placed in inconspicuous skin folds with minimal or no shaving of hair. Modern liposculpture is nearly circumferential, rather than just in the problem areas. The initial week is the period during which any pain, swelling and bruising appear to be at their maximum. Between week one and week two, it is not uncommon to feel somewhat fatigued and during approximately the third week even mildly depressed. You will generally be able to begin resumption of your normal activities in three to six weeks. Patients are back to work in 3-6 days. 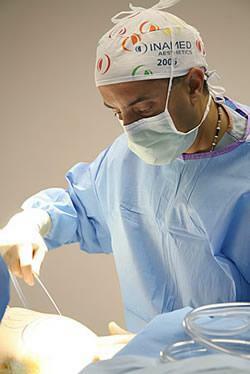 Dr. Pousti has treated many San Diego and La Jolla liposuction patients. Pousti plastic surgery also now has a liposuction La Jolla office where he consults with and treats La Jolla cosmetic surgery patients. In addition to liposuction and other body procedures, such as breast augmentation and tummy tuck, Dr. Pousti performs facial procedures including facelift and rhinoplasty. Many San Diego and La Jolla plastic surgery patients have chosen to undergo face lift or rhinoplasty to create a more youthful or improved facial image. Please visit the facelift and rhinoplasty pages of this website to learn more about these procedures and how Dr. Pousti has helped many San Diego and La Jolla facelift and rhinoplasty patients. Dr Pousti and his team are the most genuine, informed, talented and pleasant people to see you naked I think I recognized his anesthesiologist from my past BA 9 years ago. My husband really liked him as well, and felt good that Dr Pousti reached out to him. My anxiety regarding this procedure has never flared up because I was 150% comfortable with my surgeon, and that is the most important factor. My experience with Dr. Pousti and his staff has changed me forever. I had come to a point in my life that I had tomake a decision. I eat healthy, I exercise and no matter how lowe my body fat was, I could not loose weight in my “problem areas”. Ladies I think you know what I’m talking about. Genetics are evil in my family. I was unhappy with the way my clothes fit, the way I looked in a bathing suit and was tired of NEVER being able to find a good fit in a pair of jeans. I had done lots of reading and talking to people about plastic surgery in general. I spent a good 8 months thinking about it. I made the jump and started scheduling consultations. I had seen 2 doctors prior to my consult with Dr. Pousti and had just about given up. I had my consultation with Dr. Pousti and that is when I know he was the right doctor. He was kind, truthful and spent alot of time with me. I decided to have the surgery that minute. I was not leaving his office untilI had a surgery date. Dr. Pousti walked my through the whole process to make sure that things went smoothly and they did. The nurses were fabulous, the office staff was great! I can’t say enough good things about the whole experience. It has been almost 2 months after surgery and I look and feel great. It has changed the way I think about myself on the outside but more importantly on the inside. Thank you Dr. Pousti.